Loki striking the perfect pose. I’ve had my girl kitten Loki for almost a month now and I can honestly say she’s brought fresh adventures into my life. She’s going on four months old and a bit bigger than she was when I first adopted her, but I know she’ll be a fluffy, long-haired, black furred mischief-maker for many more months to come until she “matures.” Angel and Daisy are four years old now and mostly mellowed out, but they still have a bit of kitten left now and then. Loki is a very brave and bold kitten and she goes where she wants. Quite often this means she wants to walk across my desk, keyboard, laptop, mouse, and other items that help me get my work done. 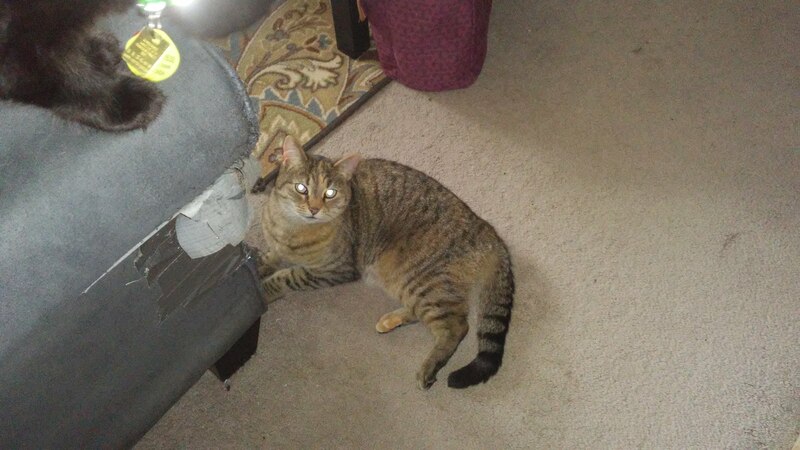 I find myself picking her up and putting her on the floor several times a day, but just like a furry, purry boomerang, she inevitably returns and walks all over everything again. I’ve discovered that if I distract her with a toy or food she’ll then leave me alone and eventually flop somewhere and take a nap or run around the house like the energetic kitten she is. Loki in her usual “flop” position with Daisy sleeping on the couch below her. Loki loves sleeping on my bed at night and she usually sleeps by my feet or waist. However, if I wake up in the middle of the night or early morning, she’s immediately sitting or laying on my chest, purring away, and blocking my view of my phone. I assume she’s drawn to the light of the phone and thinks it’s ideal illumination for me to pet her by. She’ll eventually settle to one side of me or the other and we’ll snuggle as I go back to sleep, not quite lulled by her rather loud purring. Angel and Loki on my bed. 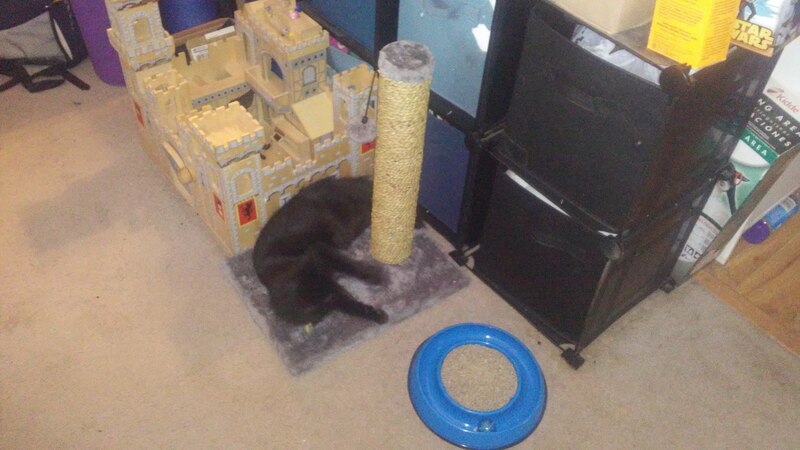 Loki is the first cat I’ve owned in many years that actually enjoys playing in the carpeted cat house I’ve owned since I was in high school. She loves laying on top of it and swatting at people or Jazzmin as they walk by. She also loves swinging herself from the top of it and inside it and is somehow unphased when she misses and thumps onto the floor. She can spend quite a bit of time going crazy on it and usually it turns into a game of tag with Angel because Angel becomes fascinated watching her play. Loki with her new scratching post. Loki recently received a new scratching post from my mother and she absolutely loves it! She knew immediately what it was for and started scratching away and playing with the puff-ball attached to the top of the post. She seems much more cat-like than my other cats in that she loves all cat toys, carries them around in her mouth, and has a fondness for human food. Owl loves human food too, but she’s a bit grumpy in her older age and doesn’t play much anymore. Owl basically dislikes all the other cats in the house but likes Jazzmin, loves my youngest daughter, and puts up with myself and my oldest daughter. 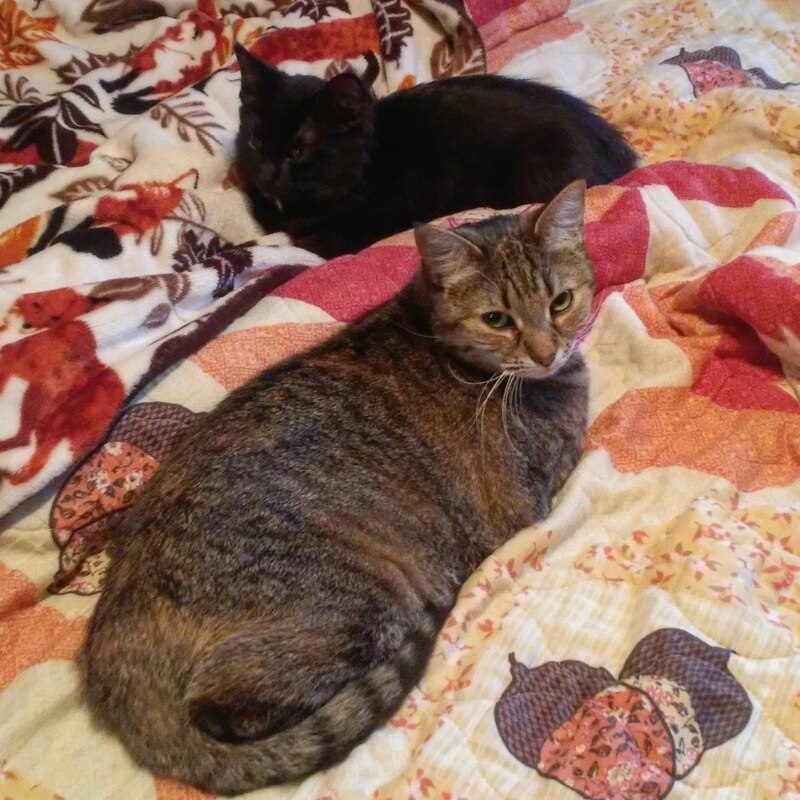 A few months ago I was perfectly content with my three cats of Owl, Angel, and Daisy. I thought three cats was fine and had no plans for getting another cat until Owl eventually passed on. However, Daisy’s disappearance and the hole that left in the household led me to adopt Loki and now I can’t imagine my life without Loki. Even with Daisy back, Loki still seems to fit the hole I didn’t realize existed in my family until I adopted her. She’s such a sweet, adventurous, fun-loving kitten, and I’m happy that I get to watch her grow up and deal with her daily escapades. Loki’s a new kitty sister that Angel loves playing with, Daisy tries to ignore, Owl growls and hisses at, and Jazzmin tries unsuccessfully to play with, but somehow that type of chaos seems about right for my life. 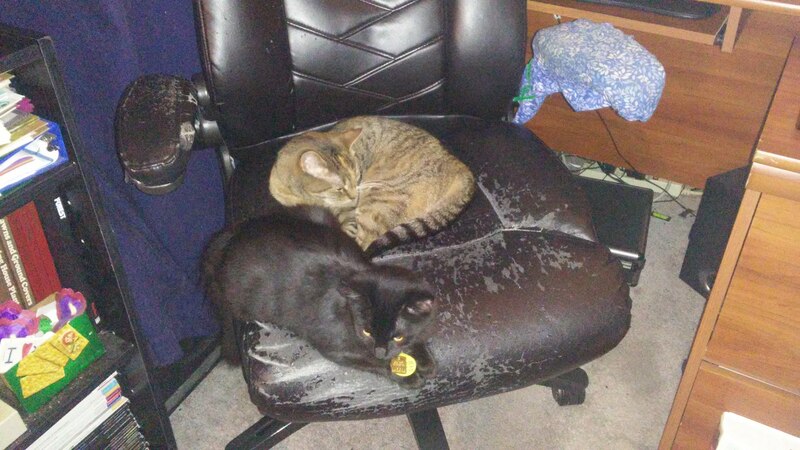 Daisy and Loki on my desk chair. I’m so happy they get to know each other! Loki in her carrier when I first brought her home. When my cat Daisy disappeared, my house felt out of balance and empty in an unhappy way. I endured a week and a half of that empty feeling before I reached my limit and decided it was time to try and fill a bit of the space she’d left. 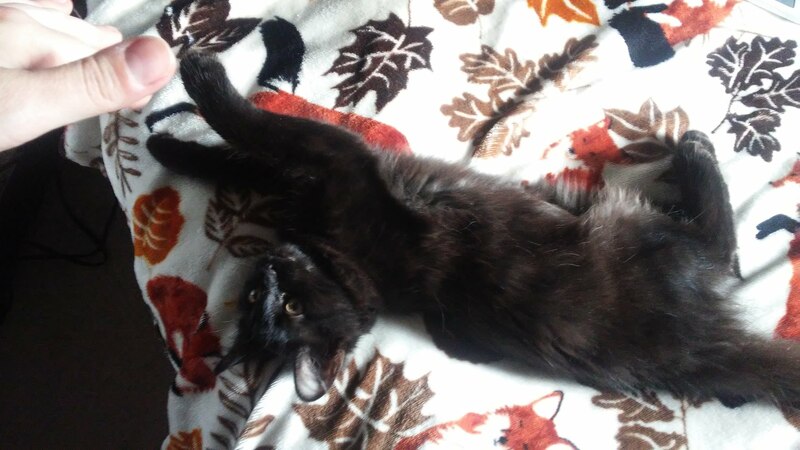 I knew no other cat could ever replace Daisy, but I thought by saving another cat from the shelter and giving that cat the happy life Daisy and my other pets have, I could start to heal my heart a bit. I decided I wanted a kitten who was outgoing enough to play with Angel and Owl even if they didn’t want to play. I have adopted older cats in the past, but I just knew in my heart that this time an adventurous and mischievous kitten was required. So on October 31st, Halloween morning, I headed out to Lollypop Farm, the same place I’d adopted Angel and Daisy from four years prior. I’d seen some kittens on the shelter’s website that looked like they’d fit the open job position. I prefer female pets because my house is already all female with my daughters and I and I don’t want to upset the balance. There’s lot of girl power in my house and I imagine any male stepping into it would find it a bit overwhelming. I arrived early to the shelter and sat in my car reading until they opened for the day. It was a reasonably mild day for the last day of October with temperatures near 60 and overcast skies. When the shelter opened, the person at the desk told me go back and look at the cats and then come out when I saw a kitty I wanted to meet. I saw several adorable cats and a few kittens, but none of the ones I had seen on the website. I went back out to the desk and told them I was looking for a female kitten three months or younger and they said they’d send an adoption agent in to see me shortly. I then went back into the cat area and had a lovely chat with one of the volunteers there who has a few cats herself and had several stories to tell. I told her about Daisy running away and my desire for a kitten and she was certain I’d find the perfect pet to take home. I hoped she was right because I really didn’t want to leave without a new pet to add a new adventure to my life. When I met with the adoption agent, she told me she had a handful of kittens in back that fit what I was looking for and when I told her about my dog Jazzmin and how she likes to play chase with Angel and used to snuggle with Daisy, the agent crossed off a cuople kittens that she knew were too timid for such a situation. She then went off to retrieve the first kitten on the list and I waited in the glass enclosed room until she returned. The agent came back carrying a small cat carrier. She said this kitten was named Loki and she was three months old. As I love the Avengers movies and am a big fan of Loki, I thought that was a perfect name! The agent set the carrier down on the floor, closed the door, and then opened the carrier. Out came a long-haired black kitten who immediately tried to jump at the glass walls to find a way out of the room. The little fluffy girl walked all around the room sniffing and I eventually scooped her up and began stroking her between the shoulder blades. She weighed under five pounds but she started emitting the loudest purr I’ve ever heard! 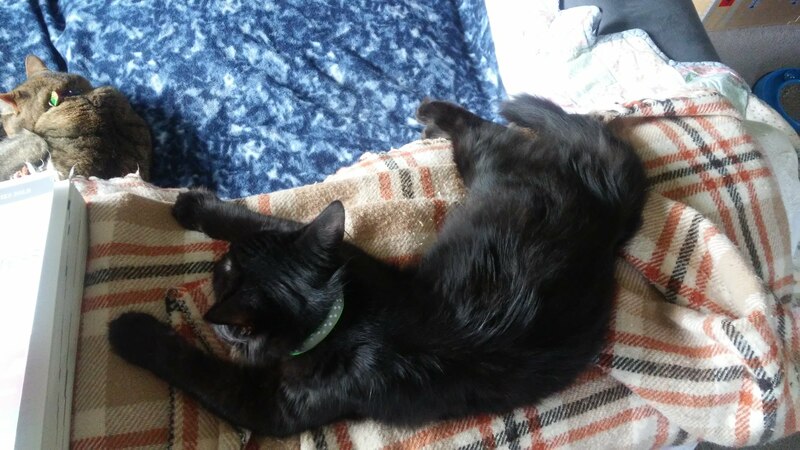 My other black cat, Owl, has a loud purr, but Loki had her beat! Suffice it to say, I was smitten. I knew after meeting Loki that I’d probably be adopting her, but I agreed to meet a few other kittens before I made my choice. I then saw two sets of litter mates, a black and white pair and a tabby pair. They were all adorable, sweet, and purred when I picked them up, but I knew I wouldn’t be able to adopt just one of the siblings and as I’d already adopted Angel and Daisy as siblings and Daisy had disappeared, I just couldn’t do that again. 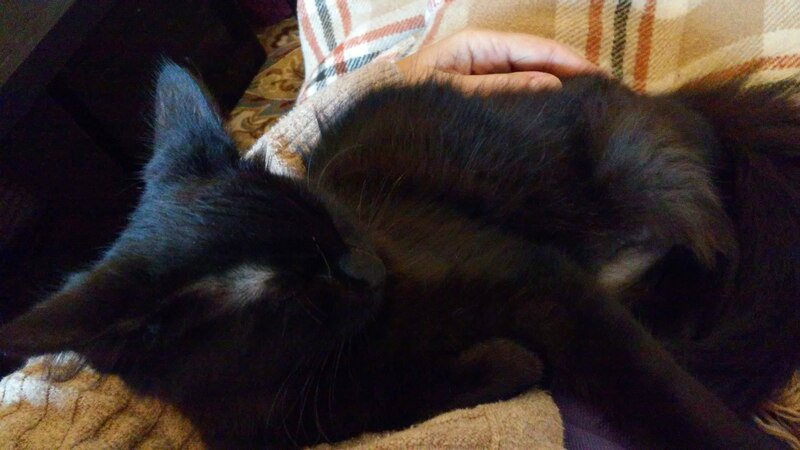 So I had the adoption agent fetch Loki again and as soon as I held her again, I knew she was meant to be with me. 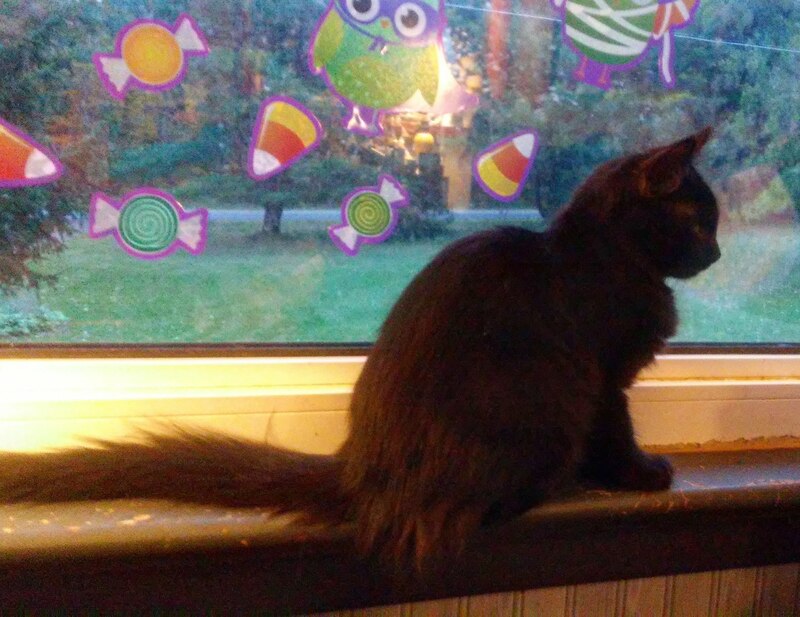 Besides, what could be more perfect than adopting a black cat on Halloween? Loki on my living room window sill. After waiting for Loki to get her final checkup, I then had to sign papers and pay the adoption fee. 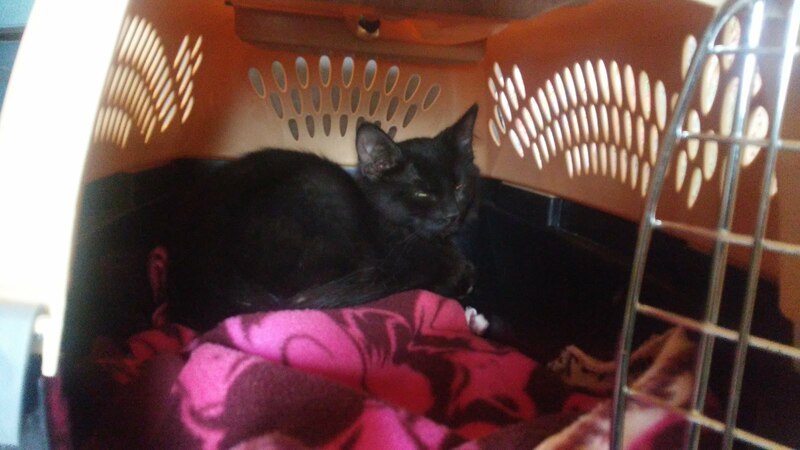 She was already fixed, had undergone flea treatment, and was de-wormed, so I felt the adoption fee was more than fair. Plus the shelter includes a free follow up at my vet, coupon for free bag of food, and a coupon for half off my purchase at a pet supply store they’re associated with. Loki laid quietly in her carrier the whole ride home and once home, I set the carrier nearby and she just relaxed inside it for a while, even with the door open. She’d just been fixed the day before so I think she was still recovering from that a bit. My dog Jazzmin was eager to meet her, but Loki was not fond of dogs and hissed and swatted at Jazz whenever she came near. I know Jazzmin wouldn’t intentionally harm any of my cats, but Loki is such a small thing and I wanted to play it safe. Angel on my lap eyeing Loki in the carrier. Owl and Angel were not thrilled about there being a new kitten in the house, but I hadn’t really expected them to be. There’s always and adjustment period with a new pet and I’ve gone through it many times in my life. Loki snuggled with me on the bed that first night and it was so bewildering having such a tiny thing compared to my much larger cats and dog. It’d been a long time since I’d had such a baby kitty because even Angel and Daisy were five months when I adopted them. Owl was probably as young as Loki when I found her in the barn, but that was 12 years ago and I couldn’t remember much of her being a kitten. Loki sniffing sleeping Owl while Angel watches in surprise. 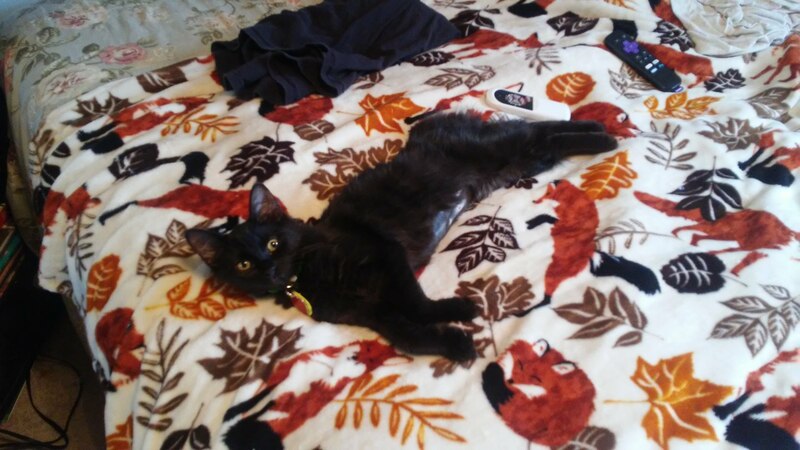 Loki adjusted quickly to her new home and bravely explored everywhere those first few days. She seemed to be a reasonably well-behaved kitten and having one kitten instead of the two I’d have with Angel and Daisy was much easier! My daughters met her that weekend and they all immediately loved each other, so I knew I’d made the right choice. Loki snuggling on the couch with me. 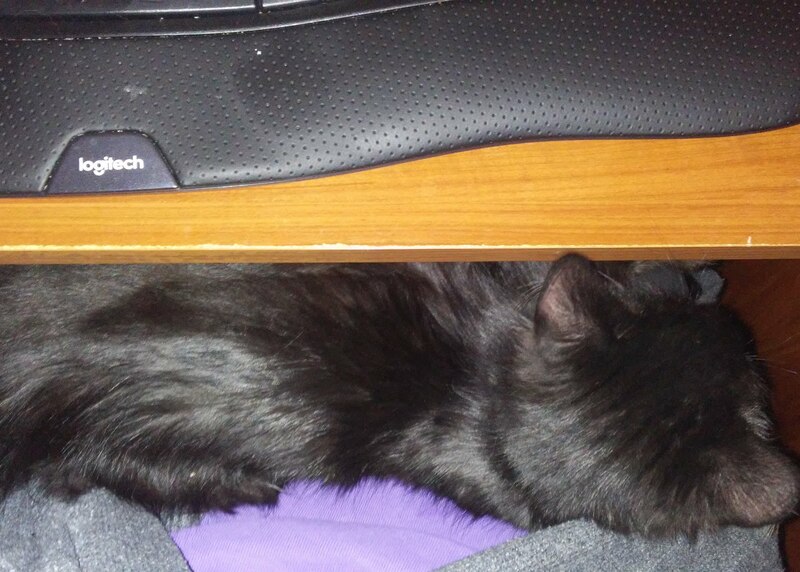 Loki snuggled under my keyboard like Daisy likes to do. Daisy relaxing on the floor by the couch as if she’d never left. I knew when I woke up yesterday morning that it wasn’t going to be a normal day for me. I had appointments in the morning and afternoon regarding the evaluation and continued support of my youngest daughter and her developmental delays. With those taking up half my day, I knew I wouldn’t be doing my normal routine of work, homework, writing, and beading. However, I had no idea the surprising and unexpected turn my day would eventually take. I got home from the afternoon meeting with the school about my youngest daughter and I was pleased by how the meeting went. It had gone better than expected and I was relieved that she was going to continue receiving the services she needs to succeed in school. On a happy high from that, I took my dog Jazzmin outside as soon as I got home and even the overcast weather, strong winds, and cold temperatures didn’t bring me down. Then as I was outside with Jazzmin, I thought I heard a meow. I held my breath for a moment and listened again and sure enough, I heard a meow. Hoping beyond hope that it was my missing cat Daisy, but not seeing her anywhere immediately, I quickly took Jazzmin back in, closed the door, and went out into my back yard again. I went around the back of my house and to my utter shock, joy, and amazement, there was Daisy crouched on the doors leading down into my basement. I could barely believe my own eyes! She was emitting this mournful meow I’d never heard before, but she looked unharmed. When I tried to grab for her, she ran off and crawled under my mower shed. I called for her a bit and I heard her meowing at me from under the shed, but she wouldn’t come out. I quickly went back inside the house, grabbed a bowl of food and ran back outside to the shed. I then crouched on the muddy ground by the shed calling to her and shaking the food bowl a bit as she meowed at me from beneath the shed. I called her name and told her it was okay and that I wasn’t mad that she’d run away. I eventually reached under the shed slowly to where I could see her tail and to my relief, she came toward me and didn’t run away. I placed the bowl of food down on the ground near where she was and kept calling to her and slowly and nervously, she finally emerged. 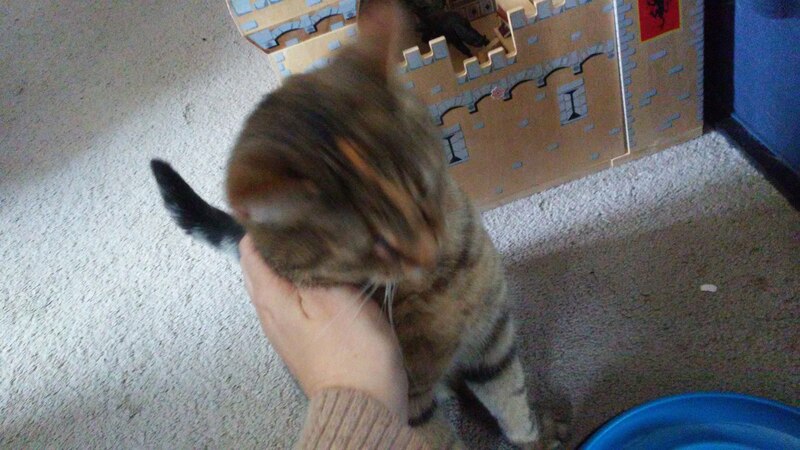 I swiftly picked her up when she was within reach and carried her and the food bowl back into the house. I couldn’t believe I was holding her again in my arms and that she was okay! She’d lost a bit of weight, but had been a bit fat when she disappeared. She wasn’t so skinny that I felt she hadn’t been eating at all during her disappearance, but she certainly wasn’t well-fed. 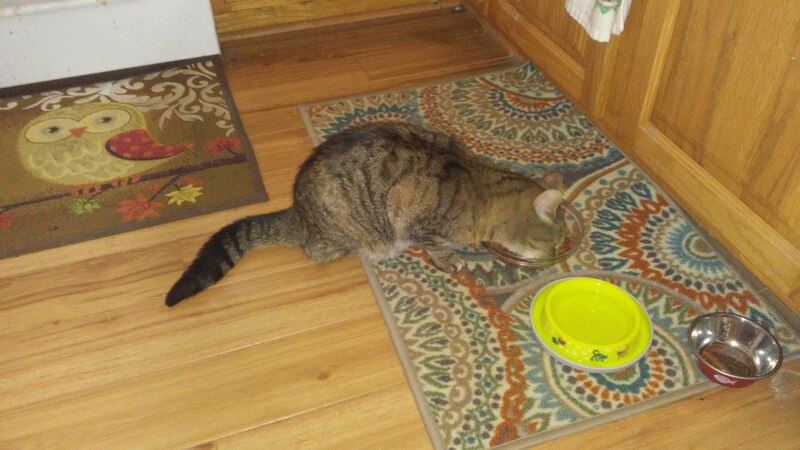 Once I had Daisy inside the house, I put her down by the food bowls and she eagerly began eating. I sat down on the floor next to her and she came over and started rubbing against me and purring and I just couldn’t stop petting her. It felt so surreal having her back in my house, eating her food, rubbing against me. I’d had dreams that she’d returned home and even a day later, I’m still wondering if it’s a dream. To have a pet I loved so much and that I believed loved me back just as much is an indescribably wonderful feeling. Daisy enjoying food when she came home. Petting Daisy as she rubs against my hand. As I write this blog post, Daisy is sitting in my lap at my desk, using my right forearm as a pillow. 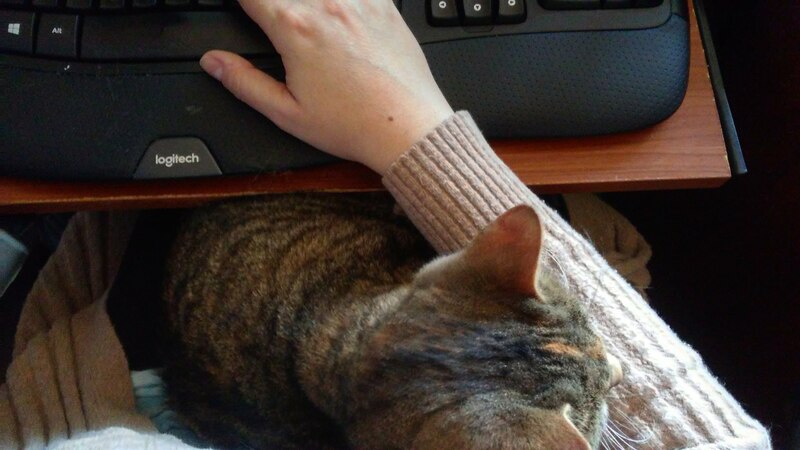 My arm keeps moving as I type, but she doesn’t care at all and just keeps purring away. She seems as happy to be home as I am to have her home and I’m mystified as to why she ran off in the first place. She certainly doesn’t seem like she enjoyed her two and a half weeks outside and I sincerely hope she never dashes out again! Daisy snuggling on my lap as I write. Daisy has been eating, drinking, and using the litter box just fine since she returned home. She meows a bit more than she used to and it’s a slightly confused and worried meow, but I think that confusion will pass. She follows me wherever I go and slept all night on the bed with me last night, only leaving now and then to eat and such. Daisy remembers her litter mate Angel and her other sister Owl and she even remembers Jazzmin and was snuggling with me and her on the couch last night. Daisy and Jazzmin snuggling on the couch with me. 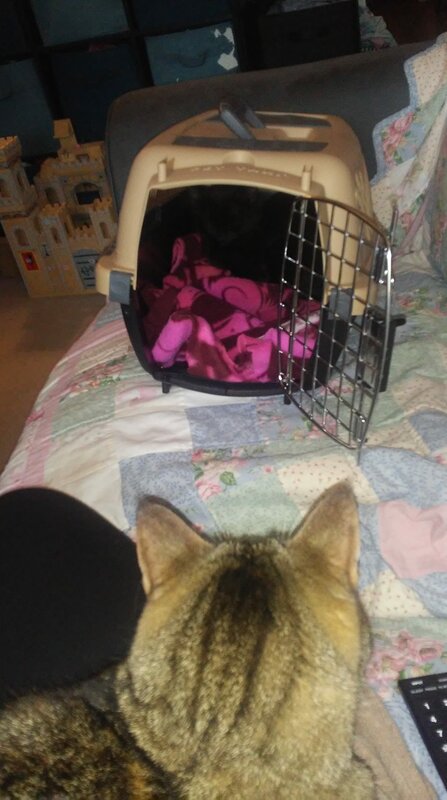 She doesn’t know quite what to think of my new kitten Loki (a story for another day) and Loki is equally confused, but they’re getting along relatively well. 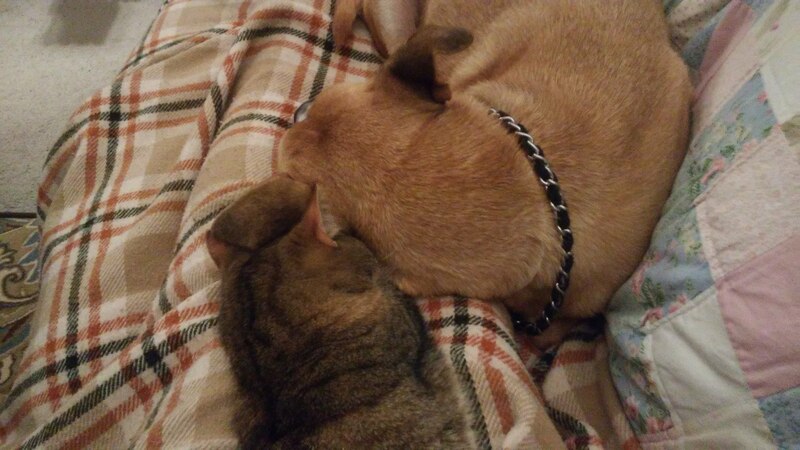 The only issue is that they both want to snuggle with me at the same time and that doesn’t always work. I said that if Daisy returned then this would be a four-cat household and that’s exactly what it has become. 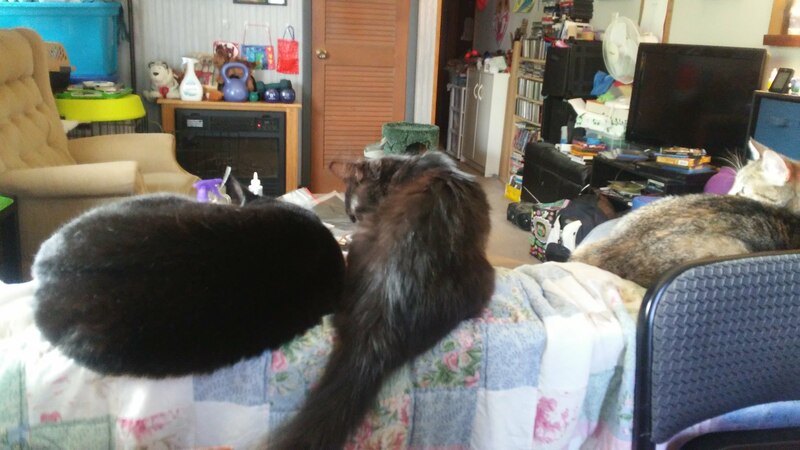 I never expected or planned to have four cats at once, but I have the room and they’re all good kitties and keep me company when I don’t have my girls. While I held hope that Daisy would return someday, I also knew that there was a possibility she wouldn’t. I live in the country where there are raccoons, skunks, foxes, coyotes, and other manner of creatures that could have done her harm. My heart would ache thinking that something terrible had happened to her and it’s such a relief to have her back, safe and happy. Daisy’s return home was a very surprising and welcome happy ending and it’s an amazing holiday present/miracle after a year that’s been full of challenges. Somehow the purring of Daisy and all her familiar mannerisms and sweetness tells me that everything will be okay. One of my favorite mugs for drinking coffee. The weather has turned cool and crisp with the arrival of autumn. Well, at least right now it’s cool and crisp, I don’t really know about tomorrow because the weather has been all over the place lately. Autumn has arrived according to the calendar, but that doesn’t mean the temperatures are going to cooperate. Yesterday it was warm and humid and I was wearing shorts. Today started out the same temperature-wise but turned rainy and cool, with glimpses of sun here and there. I’ve put warmer blankets on my bed and started using my humidifier instead of my fan at night when I sleep. I’ve also kicked those warm blankets off and torqued up the fan when it didn’t get as cool at night as I expected. I’d say this is typical autumn weather for where I live, but with climate change, I’m not sure “typical weather” is even a thing anymore. I just take it day by day and see what surprises await me. As I work from home, I usually drink my coffee at my desk, enjoying sips as I type away on my current transcription job. I tend to have more than one cup of coffee a day, but I am usually at my desk when drinking it. I drink it while I’m playing World of Warcraft or writing in my latest story, or as now, writing a new blog entry. I always have a cup of water alongside my mug of coffee to stay hydrated because coffee isn’t exactly a thirst quencher. I heard something the other day about coffee that made me evaluate my perception of coffee. Someone said that people don’t like the taste of coffee, but they put up with it for the caffeine element. I thought about that and realized that no, that doesn’t apply to me. I do actually enjoy the taste of coffee. Would I drink it black? I have in the past and while a bit bitter, it wasn’t horrible. I don’t however, drown the main flavor of coffee with my creamers, I just sweeten it a bit. As far as drinking it for the caffeine content goes, that’s somewhat true, but since I’ve been drinking coffee since I was 16 or so, it really doesn’t keep me alert like it used to. I have even been known to drink decaf coffee just because I wanted the taste of it without the caffeine. I love holding the mug of hot coffee in my hands, inhaling that familiar aroma, and then sipping at it. I like it hot, not tepid, but sometimes I make it a little too hot and can’t hold the mug without burning myself. Obviously even after so many years of making and drinking coffee, I still don’t know what I’m doing aside from just enjoying it. Thinking deeper about my enjoyment of coffee, I believe one of the reasons I love coffee so much is because it reminds me of my father. 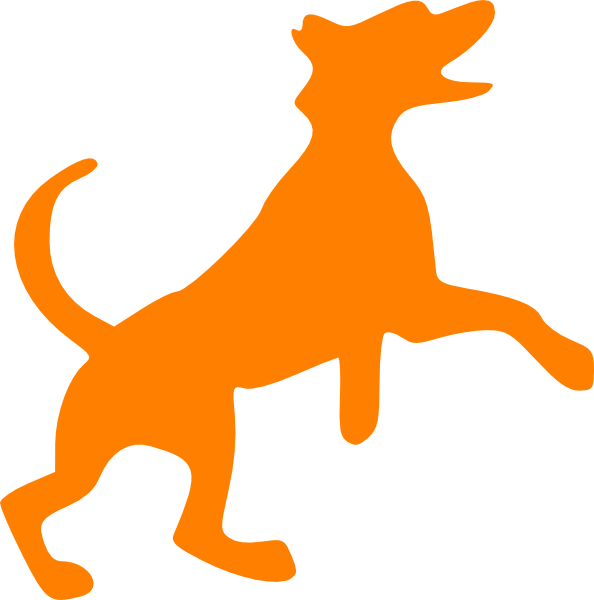 I think the very first cup of coffee I ever had was from a pot he made and as I recall it was orange flavored. It was probably some specialty coffee ground from the store, but I remember that taste so vividly on my tongue. I remember it was during a family trip to a cottage in the Adirondack Mountains and I remember waking up to the smell of that orange flavored coffee brewing in the early light of morning. 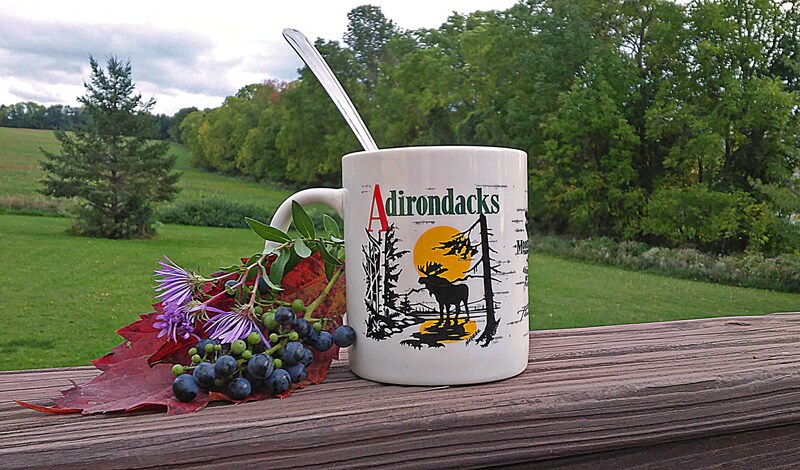 The air was cool and smelled like pine trees as it always does in the Adirondacks, and I recall that that hot cup of coffee helped warm me up on a chilly morning. To this day, hot coffee warms me up on cool days and makes me smile as I think about my father and how far I’ve come from that first cup of coffee to the amazing life I live now. Wondrous that such a simple seeming thing as drinking coffee can hold so much meaning. I set a work goal for myself this week that was higher than I’d set in a while because I knew I needed to start pushing myself to my full potential again. As probably anyone who works from home and sets their own hours knows, it can be tricky sticking to a quota of work and a schedule. But when I really apply myself, I get everything done that I need to. There were a couple of days this week that were a bit challenging, but I persevered and accomplished my goal by quitting time Friday evening. Working from home has certainly had its share of ups and downs, but it’s definitely in an upswing now and I’ve been happier working from home than I ever was working in an outside office. There’s incredible flexibility in working from home, but also a lot more unpredictability in terms of work flow and pay. I imagine it’s not for everyone, but it works for me and I love transcribing for Rev.com on a daily basis. With my goal accomplished for the week, I felt it was time to celebrate with my usual “wild” Friday night of beading, writing, and playing World of Warcraft. I’ve never really been a social butterfly or had very many friends because I value quality over quantity. So truly wild Friday nights partying with friends out somewhere has only happened due to bachelorette parties or birthday parties. Now that all of the people I consider close friends live in other states, going out on the town really isn’t even possible. Not that I really think I’d be up for it anyway. I’m a homebody, I think I always have been. And well, now that I’ve owned my own home and been living in it as a single woman for seven years now, my body loves my home even more. When it’s just me on a Friday night (which it almost always is because it’s not a night I usually have my girls) I prefer to do what makes me happy and truly revel in that happiness and freedom. I still remember what it was like during relationships where I felt trapped and controlled, where someone was telling me what to do and how to do it. Those feelings of being trapped, unhappy, and in emotional pain are something I will never forget. Nonetheless, I won’t let my past control me or ruin my current happiness and so I just keep moving forward. One of the things I do when I’m really happy, exuberant, and in a very up mood celebrating my accomplishments and freedom, is dance along to upbeat music. I might dance in my chair at my desk while I’m writing or playing World of Warcraft, or I might just jump right up and dance in my living room. My three cats might give me strange looks for a moment, but they’re used to their “crazy” mommy and so they go back about their business. My pup Jazzmin though is another story. I taught Jazzmin the “trick” of dancing with me when I’m dancing around and she’s always good for a couple spins on the dance floor. I just say, “Want to dance?” and she wags her tail and offers her paw. I then take both of her front paws in my hands, lift her up onto just her hind feet, and we do a little jive around the dance floor, otherwise known as the kitchen or living room. She’s always really happy to be dancing with her mama and I give her a treat afterwards. She’ll then return to whatever she was doing and I can go back to being happy, weird, dancing me. My favorite place to find my kind of music nowadays is a place called EpidemicSound.com. According to their website, they provide: “Unlimited music for your YouTube channel. Monetise with no risk of copyright strikes.” I pay a monthly subscription fee to listen to and download as many tracks as I want and their selection of original music is amazing! I’ve yet to use any of their music for a YouTube video, but I hope to eventually. In the meantime, I’ve been downloading songs into playlists of new music on a biweekly or monthly basis, depending on when I feel the need for fresh tracks. Baby, let it come to you. Lives outside a status quo. I lost track of how many times I listened to that song because it just lifted me up so much higher than I already was. I had my house windows open and I was blasting it through my computer speakers for all the neighbors to hear. I wanted to shout to everyone I knew that life is too short to waste being unhappy. That we all need to start living now and not keep waiting for things to get better tomorrow. I’ve learned the hard way that tomorrow isn’t guaranteed and that regret is a horrible thing to live with. Never give up on your dreams, never resign yourself to a situation you’re miserable in just because you’re trying to keep everyone else happy. I lived like that for many years and I forgot who I really was and it’s taken me years to find who I am again. Embrace your light, your power, and your strength. Seize today and every today given to you and pursue your dreams, even if only in small steps. Small steps are better than no steps and well, dance steps are even better. You see, every time I finish mowing my lawn, it looks a little different than the time before. I hadn’t mowed any yard until I bought my current house in the summer of 2011 and my first time mowing was a learning experience. I’ve gotten better at mowing over the years and it only takes me around an hour a half compared to the two plus hours it used to take me. I’m certainly not about having neat rows and the perfect looking lawn, I usually just want to get the work done and get on with more enjoyable or productive endeavors. Sometimes I miss spots and have to go back and I have trees to go around and sometimes I take turns too sharp and have to double back. To make mowing go faster and have some degree of enjoyment, I always listen to music while I’m mowing. I put my earbuds in and then put my ear protection ear muffs on because I know earbuds are not sufficient for protecting my hearing from the loudness of the mower. I plug my earbuds into my phone and put on my latest “mowing mix” of up tempo dance type music and get to mowing. My mind tends to wander while I’m mowing. Heck, my mind wanders pretty much all the time and always has. When I’m mowing I think about all sorts of things. I figure out story lines in my latest book, think about future blog posts, mentally go through my to do list, or dream up scenarios that will probably never come true. I pay enough attention to what I’m doing to dodge beneath low tree limbs and stop for crossing butterflies, but otherwise my mind is usually worlds away from my 1.4 acres of land in Upstate New York. Well, this last time I mowed, my mind apparently wandered so far and I got so lost in the music, that I mowed on a peculiar automatic pilot. 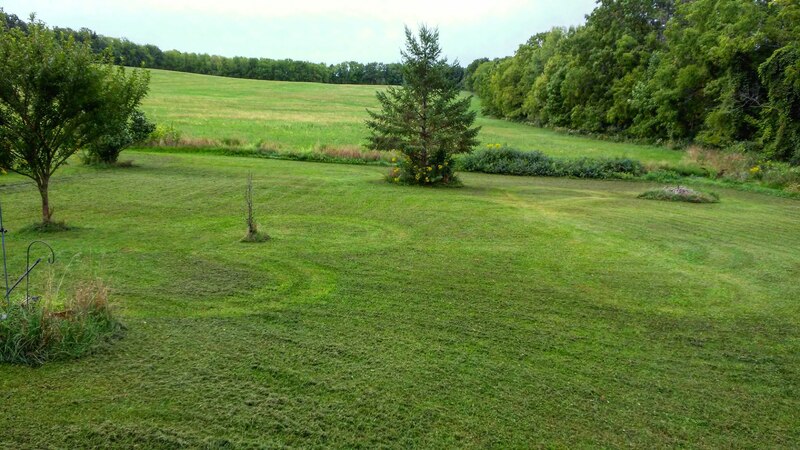 I thought I’d done my usual mowing job, but when I looked out into my back yard the next morning, I saw some rather odd patterns. I imagine I must’ve gone back over missed spots and around trees more carefully, but I think a lot of it was just because I was so uplifted by my music and my thoughts that I just went with the flow. The weather wasn’t too hot for the first time in many months and it was the Friday before I got my girls, so I had plenty to be happy about. Whatever the reason for my peculiar and puzzling patterns, I still managed to get my lawn mowed and I don’t have to worry about it for another two weeks hopefully. While my lawn may not be perfect or up to the standards of some and it certainly doesn’t have straight lines, the point is that it’s my lawn and I can do whatever I want with it. It’s very empowering owning my own land and being able to do as I please on it without being told I’m doing it wrong or that it needs to meet certain standards. Sometimes it can be a bit challenging living in the middle of rural nowhere, but most of the time, it’s exactly what I need. Saturday morning of the MCNAA Spring Planting Moon Pow-wow I woke early (as I always do, even on vacation), enjoyed the hotel breakfast, and worked on a beading project I’d brought with me. I never go on a road trip without some beading supplies, as I know I’ll always have some time to work on new creations. It was already humid when I got up and I knew the day was predicted to be just as hot as Friday had been during setup. 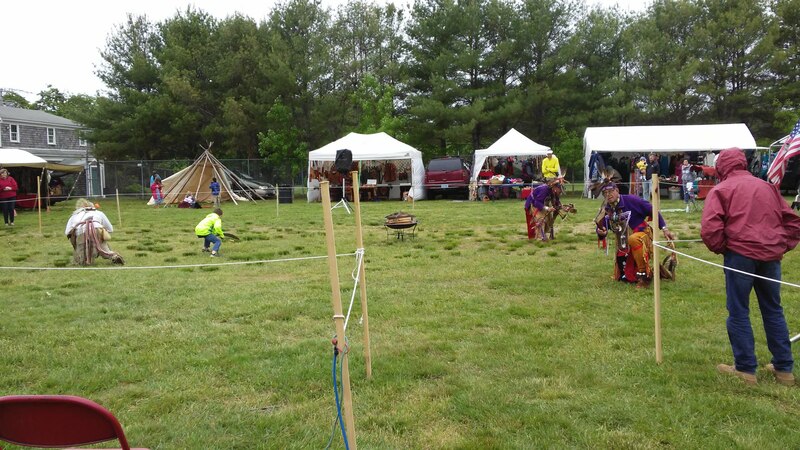 Once fed, washed, and dressed, I headed to the Marshfield Fairgrounds to help out at with the final setup of the MCNAA Spring Planting Moon Pow-wow. I arrived a few hours before the gates opened and helped the board members and volunteers that were already there finish setting up the MCNAA booth. 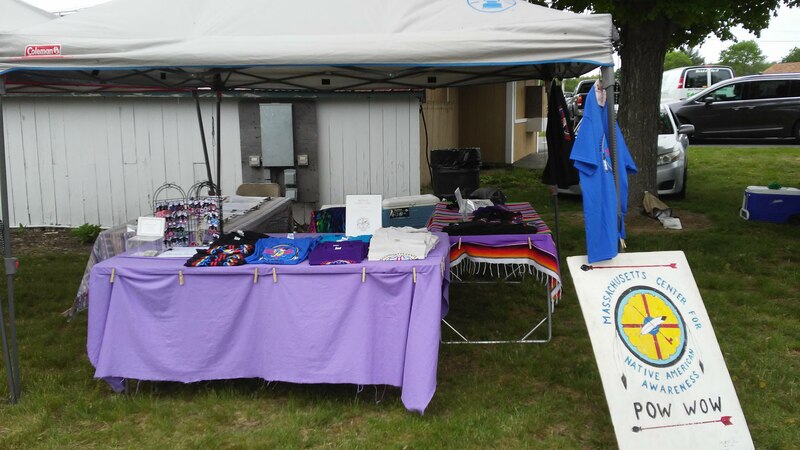 The booth usually has three tables, one covered with free, helpful information about various Native American topics and the other two holding MCNAA merchandise such as shirts, patches, and bags. One of the board members was nice enough to say I could set up a little spot on the tables to sell my beaded jewelry and I’ll go into that more in a future blog post about my first experience as a pow-wow vendor. I set my bag with some beading stuff by one of the chairs in the MCNAA booth and I enjoyed the shade of the canopy as the day quickly warmed up. There was a breeze, but it was still quite hot by the time the event started. 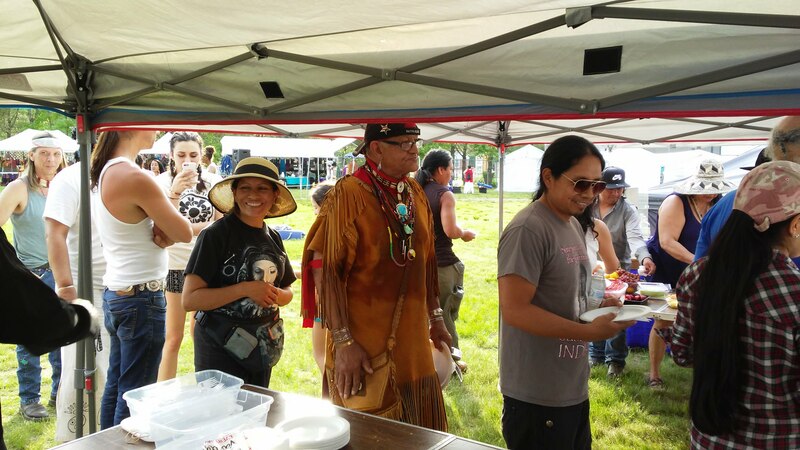 In previous years, I have gone out and danced in the heat and the sun, but on that Saturday of the pow-wow I chose to remain in the shade of the booth to assist other MCNAA volunteers with answering questions, selling merchandise, and helping out however I could. 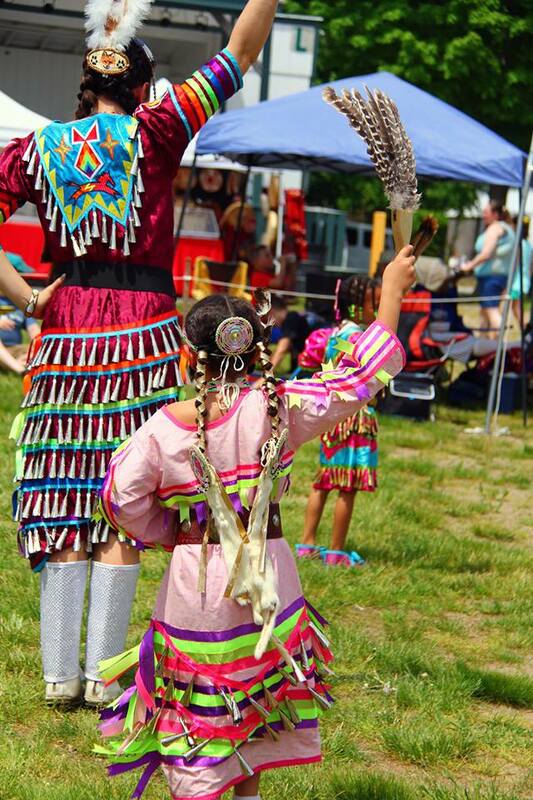 Despite the heat, I enjoyed my time volunteering at the MCNAA pow-wow on Saturday and made sure I stayed hydrated. When I wasn’t busy helping people who came up to the booth, I would work on my beading project and also on mending my fringed shawl that I accidentally ripped at a pow-wow the previous year. 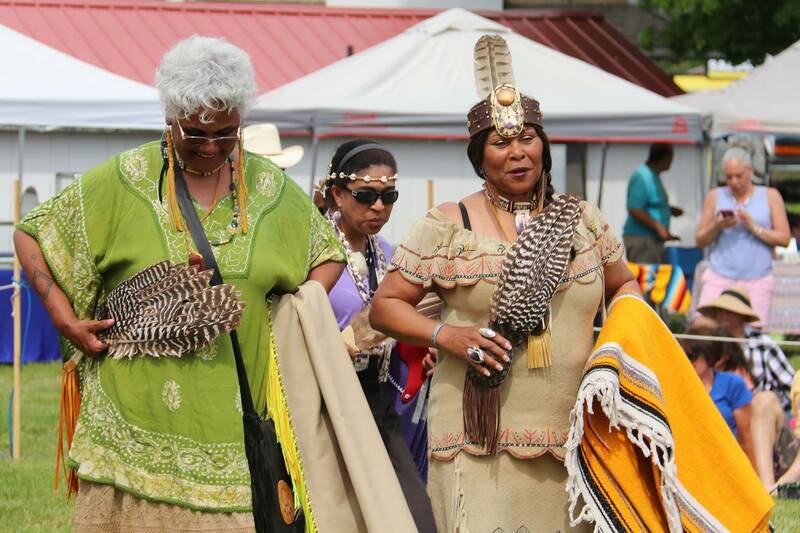 Overall, I felt it was a wonderful day for the pow-wow and that MCNAA received some nice donations, sold several shirts, and some patches. We had a special meal that evening to celebrate Harry the Hawk’s birthday and it was nice sitting down with dancers, volunteers, and vendors to discuss various things. The weather prediction for Sunday called for much cooler temperatures with a chance of rain and that prediction arrived quite accurately. While Saturday felt like late summer, the weather Sunday felt like early spring with temperatures in the 50’s, overcast skies, and a cool breeze. I welcomed the change wholeheartedly as it meant I’d be able to dance in the Circle that day without worrying about getting sunburned or becoming overheated. As the morning was quite chilly and there were fewer attendees expected due to the weather, the grounds were quite deserted when I arrived in the morning. I sat in my car while myself and the other volunteers waited for people to arrive. I busied myself putting the finishing touches on the jewelry display I’d updated for that day (again details will follow later). Eventually I ventured out of my car to see where I could help MCNAA that day. I asked one of the board members if I could set the booth up and she said yes and that was the first time I’ve set up the entire booth mostly by myself. I was thrilled to do it! I love volunteering because I feel needed, useful, and helpful. Being able to set up the whole booth by putting on the tablecloths, setting out the information, and setting out the merchandise made me feel like I served an important purpose. I may not have set everything out perfectly, but I did my best and was proud of what I accomplished. On Saturday, I was too hot to wear my shawl, but on Sunday it was so much cooler that I kept my lighter shawl around my shoulders and used my heavier shawl as a blanket on my legs. 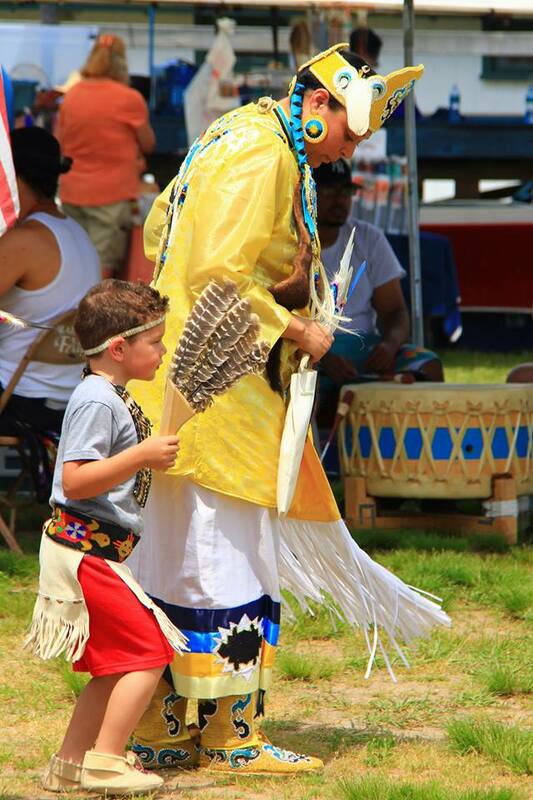 I was happy with the cooler weather though and eager to get out and dance when the drums started. There were far fewer people in attendance that day and not many dancers, but that didn’t keep me out of the Circle. 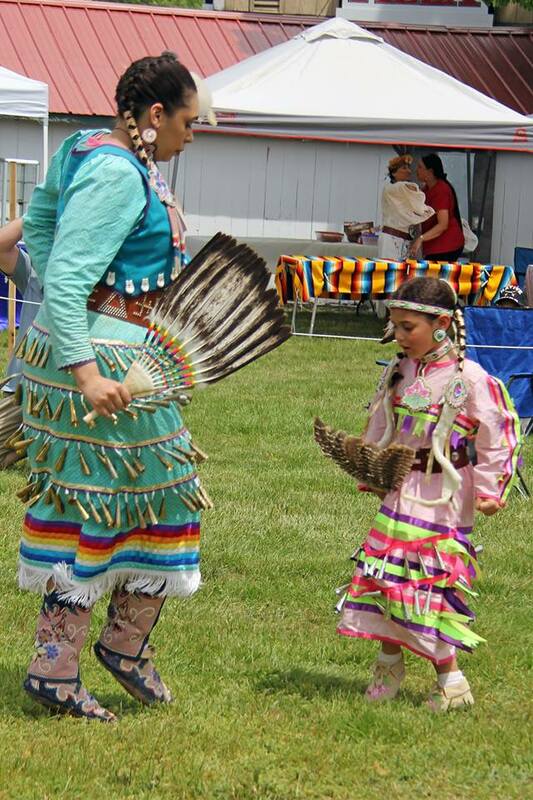 My two favorite dancers, Harry the Hawk and Lee Braveheart were out there dancing and I joined them whenever possible. They were happy to see me in the Circle and their smiles and encouragement always lift my spirit, and my feet! 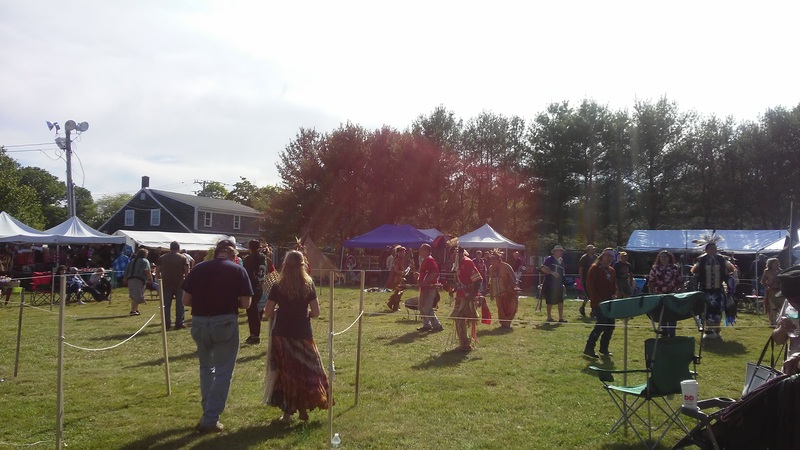 I danced almost every inter-tribal song that day and found the weather pleasantly cool. 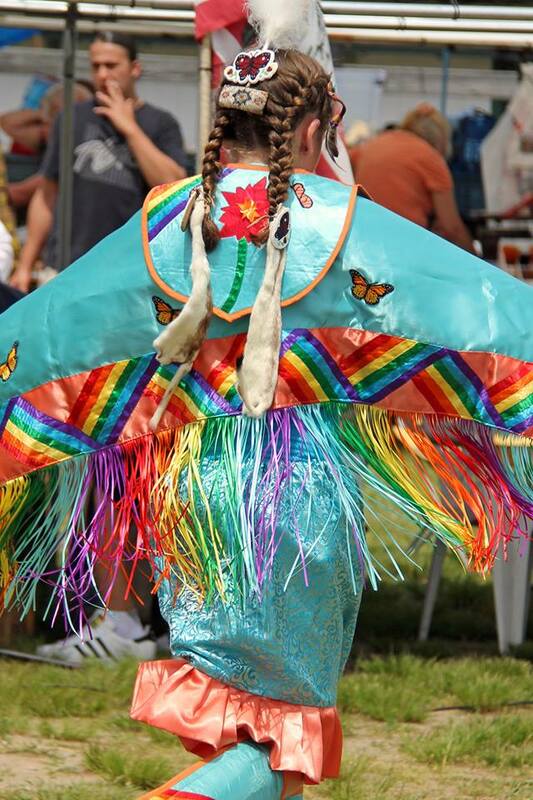 I did realize that I was very much out of pow-wow dancing shape and vowed to work on that before the next pow-wow. When I wasn’t dancing, I was at the MCNAA booth helping where I could. Despite the low attendance, I felt it was still a good day and I was invigorated by the dancing. Sneak up dance featuring my favorite dancers, Harry the Hawk and Lee Braveheart. The pow-wow wrapped up early when it started to rain and the cooler temperatures made it much less exhausting during take down of the pow-wow. Everything that we had put up Friday had to come down and usually the taking down goes faster than the putting up. It was still a small but determined crew of volunteers doing the work, myself included, and we got things down relatively quickly. 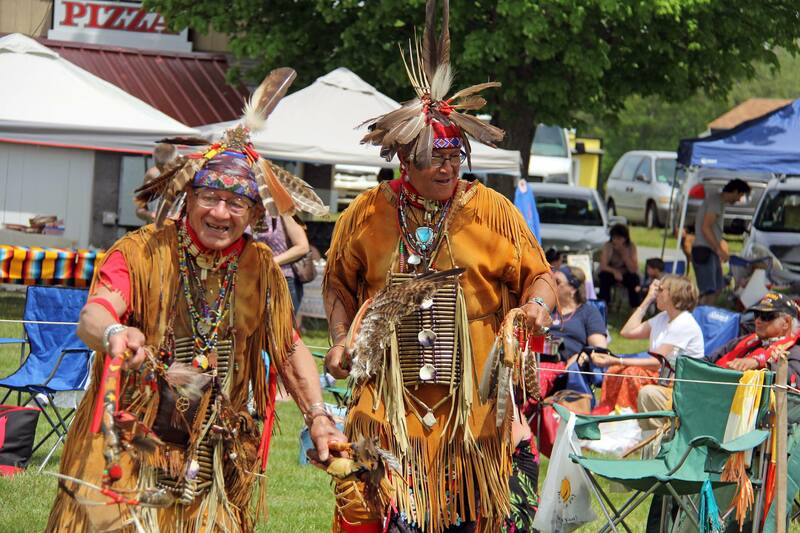 I said my good-byes to Harry and Lee and promised them I’d try to make it to the September pow-wow at Plug Pond in Haverhill, MA. When everything was down and the MCNAA crew was ready to head out, I said goodbye to everyone and enjoyed the hugs and well-wishes. As I drove back to my hotel for the night, I was beaming with joy and my spirit was soaring from the pow-wow atmosphere. For me, nothing compares to volunteering for the MCNAA and being able to dance in the Circle. It is a much needed reminder that I matter in this world and that we can all make a difference, if we’re just willing to make the effort.